I splurged and bought a new bag today and I love it! 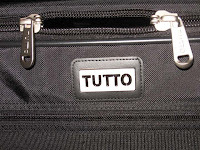 It is a Tutto and it must be the Cadillac of bags, lots of pockets and zippered compartments, I just hope I can remember where I put things. It is all set up and ready to take me and my sewing paraphernalia to class. It was a bit pricey, but it will hold a lot and protect my most prized possession (at the moment). It rolls and steers so smoothly. It will hold another 150 lbs. on top of it so that means more of my stash can go into a duffel bag and go to class with me too! 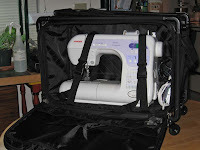 Now I am ready to travel with my sewing machine or anything else for that matter. That is kind of funny since anyone who knows me well knows that I hate to travel and am most happy right here at home, but we will see where my new Tutto Machine on Wheels will take me - probably just down the road a few miles to a sewing class. I spent most of the day working on another old friend - Thyme to Water. 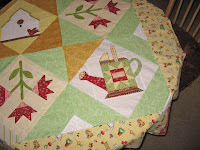 It was a small quilt top that I put together a while ago. I was having trouble getting it to look just right so I put it away for a while. It was on my to do list for working on this week since I have some time off work. I pulled it out yesterday and decided to totally remove one block that was just not working for me. The block was, of course right smack in the middle. I got motivated somehow to design a new block on my own from scratch. After working on all those 12" blocks recently I felt confident that I could handle it. I got out the graph paper and went to work. I actually paper pieced parts of it right on the graph paper. I really liked it, but it needed a little something. I don't know if any of you have a man in your life who is actually semi interested in your sewing, but I have been blessed with a man who has a real eye for color and he always shows an interest in what I am doing. He gives me advice whenever I ask for it on my projects. At work we pot custom pots and the best pots are the ones we collaborate on. He has this thing he does with "color echos" and today when I asked his opinion for the bird house he said, "It needs something red that you have in all the other blocks, a color echo." That was all I needed to see that he was right and I knew just what I would add...a little red bird to sit on the step of the bird house. 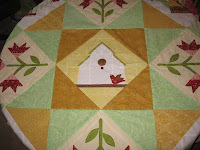 This quilt is not perfect and really gave me fits making things go together just right. Some of the fabric was really old and stretchy, but I have it to a point that I am happy with and I will try to get it quilted this week if I can fit it in on my long list of things to do with this little bit of time I have to myself. Funny thing...I was thinking of how Michael gives me color advice in sewing and gardening, but when we are fishing he always asks me which color lure to use. It is sure nice to have someone to share your opinions with...hmmm...most of the time! Watch for those color echoes...you'll be surprised how many you find in nature. Yes, a bag with lots of pockets is the best!!! Your quilt is coming along very nicely!